Eucalyptus cephalocarpa is commonly called the Silver Stringbark, an attractive medium sized tree that will vary in height depending on conditions. Used as a street tree as well as in parks and gardens it is adaptable to a range of conditions. Usually growing with a straight trunk, the thick bark is of a fibrous nature. 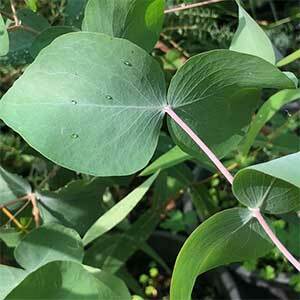 The foliage is a good silvery green and the flowers are best described as a creamy white. Flowering from late summer through to winter, the flowers attract bees and the insects to the garden. The flowers are followed by small nuts. The juvenile foliage is very attractive, however this is not a species that takes well to coppicing so its use as a hedge is limited. This is a tree that copes with a range of soil conditions including periodically waterlogged soils. Once established it is reasonably drought tolerant. Used as a background feature tree, as a windbreak or visual barrier or as native fauna attracting plant in parks and gardens. Soil – Best in moist clay soils and will tolerate periods of water logging. Spread – Will form a crown to 5 to 10 metres, mature specimens grown in the open sometimes more. Flowers – White to Cream.